David Meltzer's poetry is jazz-based because it can be nothing else; beginning with growing up in a musical household and being exposed at an early age to the then-and-always-new sounds of the bebop revolution, moving on to the jazz-poetry fusions of 1950s San Francisco and his participation in the 1960s band Serpent Power and performances with the 1990s collaborative ensemble Mix, his own musical experience has been central to the mobility and immediacy of his aesthetic. Instead of flattering, imitating, or plundering the jazz tradition, which he has always considered as a gift, not an exploitable resource, he has entered it via the high, hard road of attentive learning and listening. 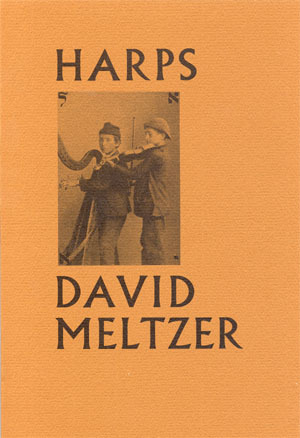 In his preface to his sequence Harps (Berkeley: Oyez, 1975; unpaginated), Meltzer announces his intention to "follow music as a central source of self-history." Nearly everybody in this airwave-dominated culture has had the experience of hearing one or more songs and associating them with complexes of memory and emotion that evoke the moments in life in which they were first heard. By responding to the subjective messages carried by the sound, the individual measures his or her life in terms of music. As with the individual, so also with the species -- "it's never been without music," as Meltzer affirms. Listening both precedes and accompanies the act of storytelling; through it, the oldest tale preserves its freshness, the most often heard solo its capacity to surprise. The challenge consists in telling it yourself after you've heard it. Each word becomes a tone to be bent, jabbed at, inverted, sustained, multiplied, fragmented, or s(w)ung. Language is a harp, a sounding board of the poetic impulse; those who play it are themselves harps as they "travel in creation" while making music. Dots for notes. Letters into words. Numbers combined, wed to please. Light. Words, notes, numbers. Spread out. An image of every living thing. On file. Earth weighed down with trophies. Tracks stacked in piles. Traces. All doors open to the sound of your song. Tracked & punched. Held in a reel. In its careening, back-and-forth skidding, stop-start staccato momentum and raised-pitch iterations, this poem recalls Ornette Coleman's up-tempo harmolodic bop excursions. Each key word contains multiple meanings and rhythmic inflections that blur the possibility of a univocal reading. Occasional homonymic variation -- "Steps. Stops," "Dots for notes," "Tracks...Traces" -- produce semantic as well as sonic shading; steps are not only paces but movements up the stave of the octave and can be half or full, and stops refer not only to arrested motion but to the pitch alteration produced by the closing of an aperture -- hence, the use of stops alters the steps. And "steps" echoes the second syllable of the preceding "landscapes," calling attention to the "escapes" hidden in the sound which are abetted by "steps" and stymied by "stops." Eye and ear inevitably gravitate to the syllables because, like a bop solo strung together out of sixteenth-notes, most of the words do not exceed two syllables and the three four-syllable words ("duplicated," "accessible," "information") disrupt the pace with their longueurs. The poem's core-word is "track," which refers not only to the poet's own intention to follow -- hunt -- music, but to an album "track" and "track" as a trail or railroad track (where the whistle announces the presence-absence of the train), as well as an overall "sound track" or backing track. "Mind's at it all the time. On the line" is a fine example of jazz-style syncopation: a nine-syllable line is broken up into three symmetrical phrases, with the accent falling on the seventh syllable after the period and the third phrase "on the line" echoing back to the "time" of three words back. "Time" is the rhythm in which music moves, and the "line" is the unifying space of the sound-web (and the lines of the stave on which the notes are arranged). Colloquially, "on the line" refers to the risk assumed by the player entering the break. So the mind has to exert some influence. On the other hand, the quest to order letters into words and to read dots in order to produce notes tends to privilege the mental faculty, which is compelled to "hunt down song" as if it were a quarry. (Here, the poetic field shifts its ground, imitating the movement of mind "closing in" on its prey.) Potentially, this gives rise to a situation where "everything alive [is] on exhibit," a universal cataloguing with little room for spontaneity. Rather than hunt down and display the spoils of song, it is preferable to have the awareness (expressed in the line's proclamant tones) that "all doors open" at the musical (or poetic) moment and "close to your silence" (although "close" can also be taken in the sense of proximity). Paradoxically -- as implied by the slammed-door finality of the last three lines -- the poem's teaching is itself a prize won through the mind's enterprise, and the dominant technology's prison that holds the song in a reel -- of tape? of dancing figures? of drunken lurching? -- also makes it possible to listen anew to a spontaneously crafted sound, transform it into a "landscape," and begin all over again in the infinite possibility that will always, one way or another, reprise the eternal quest of mind. Unfolds as in a movie. Certain phrases recall "The quest ...": The finality of "said & done" counterpoints the other poem's "Like that. Done." "Bulb'd thought" alludes to "light. / Mind's at it all the time," the second stanza's "threaded in loops" harks back to sense and rhythm to "Held in a reel," and the poem's last line "Stops" reverses the other's concluding line, "Begin." Again, the only word longer than three syllables -- "Realization" -- is crucial to the poem, although here its length emphasizes culmination and triumph, reflected further in the juxtaposed "Creation." The sparseness of the opening stanza (with no initial capitalization of line beginnings) contrasts to its matter, which speaks of a transcendence perhaps beyond words' power to communicate: "uprising" contains both its insurrectional (in homage to the bebop revolution) and elevational (as in the spiraling flights of the solo instruments) meanings. "Out of above" alludes to "Out of Nowhere" (the title of one of Parker's favorite standards) and to a realm higher than above to which the uprising aspires. "Above" also connects to "the end of / earth," extending the hyperbole, abruptly closed off by the "said and done" of possible expression. The poem reorients itself toward the music and builds a crescendo around a single cosmically charged image of music as a phallic pole (the poteau-mitan at the center of the Vodou peristyle?) which releases an orgasmic "star flash." The poem again shifts its focus for the conclusion, this time spotlighting music's primordial "sound realm," and just as the momentum builds, the "bulb'd thought" spooling through the reel of sound stops, without a punctuating period, as if the tape ran out in mid-chorus. However, the lack of a full stop implies openness, a passage first into air and then into the texture of the universe: the final triumph of improvised music, which, as Eric Dolphy declared, could never be captured again. Asaph, the "work-in-process" of which Meltzer announced Harps to be a part, either never appeared or has yet to appear. But the unifying theme of that promised work -- "music as a central source of self-history" -- re-emerges twenty-five years later in Meltzer's long jazz-poetic sequence No Eyes: Lester Young (Santa Rosa: Black Sparrow, 2000; all subsequent page references to this text will be in parentheses). Throughout No Eyes: Lester Young, Meltzer intersperses lines taken from the popular standards on which Young worked his improvisatory magic, recalling that Young himself made a point of listening to song lyrics in order to do sonic justice to the emotions the words conveyed. The first line alludes to the opening of "Smoke Gets in Your Eyes" -- "They asked me how I knew / My true love was true" -- a song that speaks (beneath and notwithstanding the undeniable corniness of the lyric) of misplaced faith in a lover and the deceived one's unsuccessful attempt to maintain, against the condescension of friends, a publicly stoic denial of grief. Here, then, is a restatement of the far-from-romantic "oneliness of the Long Distance Runner," as Bob Kaufman put it; against the interrogations of the elided "they," whose brisk sequence of relative pronouns "who, why, how, who, what" that begin lines 2 through 6 recalls the punitive litanies of a military or police tribunal intent on ferreting out subversion. The compulsion to know "what's the secret," characteristic of a peculiarly American drive toward a pretended omniscience that, on closer examination, yields only ignorance, is apparently gratified by the Young persona's forthright "I told them everything." However, if this "confession" is seen in relation to an earlier sequence -- "it's not tragic jack / it's facts made bells / rolled into chime smoked carillons / a million bucks can't touch" (137) -- what the narrator actually "tells" his interrogators about himself ("who I was"), his creative co-conspirators ("who they were"), his technique ("how I did it"), the tradition of which he is a part ("who I got it from"), and the "secret" that allegedly explains everything else, is something that almost by definition they cannot comprehend. In the words of Amiri Baraka's own poem about Lester Young, "Pres spoke in a language / all his own," and further, as Louis Armstrong remarked upon being asked similarly intrusive questions, "If you have to ask, you'll never know." The process through which the "facts" fetishized by the vigilantes of a prosaic "reality" are transmuted into "bells" (a word Young used in conversation to convey pleasurable sensations) -- where life becomes the fertilizing soil of music and poetry -- cannot be "heard" by the inquisitors because it is not what they or their "million bucks" can buy or "touch" (the word "touch" has a colloquial meaning of "mooch" or "swindle"). The beginning of the poem in medias res and the off-center grammar evoke Young's own bandstand posture of holding his tenor saxophone at a skewed angle. What, for example, is the antecedent of the possessive pronoun "its"? The only preceding singular noun is "pain," but that is the object of a prepositional phrase; were the thought to flow "smoothly," the conjunction "but" would not be there and the "work" of the second line would be carried out by the "ways and means of pain." Perhaps, however, it is indeed the pain itself that works and the ways and means that announce. "Body & soul" could as well be a unity expressed as a duality -- after all, beyond all post-Cartesian speculations, "Body and Soul," considered as the title of a song made famous by Young's colleague Coleman Hawkins, is a singular creation. The image of the freely delivered telegram -- a message in shorthand or code -- points both to the listener's responsibility to "decode" the sounds he or she is hearing and to the qualities of the gift of which all creative work partakes. The syntax clears up for the final three lines, which affirm the commonality of the musical impulse (which is equated to speech in that both are "played"), conceived in improvisational terms as a way of facing the challenge of the break, which Ralph Ellison has equated to an existential risk in which the participant must literally stake everything he or she's got -- "world and self" on the immediate demands of the moment. One loses oneself in order to find oneself more truly in a (at least temporarily) nonalienated world. In the early 1990s, I caught a glimpse of what this challenge meant for David Meltzer himself, on the most personal level. He and his wife, singer Tina Meltzer, and his fellow poet Clark Coolidge, longtime friends and former cohorts in Serpent Power, had put together a group called Mix that was performing at midnight at the Poetry Project at St. Mark's Church in Manhattan. I had recently arrived in New York after spending most of my life in the San Francisco Bay Area, and I couldn't pass up this chance to see my beloved teacher from New College of California again. When the trio started to play, it seemed a rather unlikely combination of artists on some kind of busman's holiday: Tina, already at that time gravely ill, sang in a clear but slightly shaky voice; Clark played his drum kit all "wrong" from the technical standpoint, flailing away with lanky arms at the toms and cymbals; and David played scratchy guitar licks, not-quite-blues, not-quite-jazz, not-quite-rock. Then, about ten minutes in, everything seemed to click into another dimension: Tina's fragility became tranquil tenderness, Clark's drumming showed itself as subtle, unobtrusive, and splashy in all the right places, and David's guitar style began to sound like nothing I'd ever quite heard before, marked by unusual choices and unexpected forays into angular dissonance. And as Tina sang her blend of original compositions and standards, David, even as he played, regarded her with a look of adoration that communicated a full vision of a life long shared. And I recalled that when he spoke to me of their marriage, he quoted from the Gershwin standard, Ira's lyric and George's last, "Our love is here to stay." Remembering this, and seeing them in that place, playing that music, another song lyric entered my mind, made famous by Billie Holiday's plangently chiding performance, "You don't know what love is."